My real name is Chris Beeman and I live in Indian Trail, NC right near The Divide, Emerald Lake and Charlotte National. I've been playing golf regularly since 1999 and try to play at least once a week during prime season. I created this site back in 2002 because I was frustrated with the lack of complete, up-to-date course information for Charlotte area courses. Word of mouth and a great community of golfers that want to help other golfers has helped the site grow into what you see today. I learned to play at a local par 3 course near me (Pebble Creek off US74) and then graduated to full courses. After about a year of playing, I finally broke 90. It took another year to shoot an 81 (up at Crescent Golf Club). I shot that score using 6 clubs -- Adams Tight Lies knockoff woods 5, 7, and 9, a 38* chipper (that I could hit almost 150 yds with a full swing), sand wedge and putter. I had some no-name oversized irons, but wasn't very good with them. So I would just use the woods and the chipper and vary my swing to get different distances. It wasn't very precise, but would generally keep me in play. Occasionally, I was deadly accurate with the chipper inside 125 yds. I shot another 81 a couple years later (2003), but mostly shot scores in the high 80's to mid 90's up til 2005. 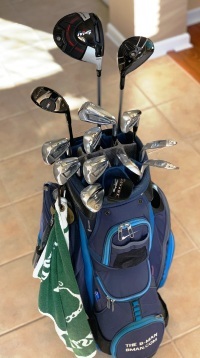 I finally decided that I had to become a "real" golfer and got a new set of King Cobra irons that I really liked. I worked on learning how to hit iron shots and be more precise with distances. In the summer of 2005, I shot a couple of 81's and an 82. My handicap got down to 13 or so for the first time. I took 3 1-hour lessons with Scott Fossum from Charlotte Golf Links and he helped me with my grip and full swing. Late in 2007, I broke 80 for the first time with a 79 at Emerald Lake and my handicap hit a then career-best 10.9. I had a good summer in 2008 and hit 79 again at a course in NY (Peek'n'Peak Resort in Findley Lake). I also took an 1-day Dave Pelz Short Game clinic. That helped tremendously with my pitching, chipping and putting. I went out and bought a 60* lob wedge after the clinic and have loved the new dimension it brought to my short game. In the summer of 2009, I played a ton, about 25-30 rounds in May, June and July. I bought a new TaylorMade Burner driver in July and then went out and shot a career-best 76 at Edgewater Golf Club in Lancaster, SC. The next summer I finally took the plunge and signed up for a 1 year membership at Emerald Lake. The course is only about 5 minutes from my house, I had gotten to know the head pro and manager pretty well, and it was a great deal ($1995 for everything, including carts). So I played as much as I could in that first month and hit my stride, consistently shooting in the low 80's, including an 82 in my first club championship round. In 2011, I decided I was due for some new irons and so I upgraded to a set of Cobra S3 Max irons. I also bought the new Tayormade R11 driver that June. I had decent success with those clubs and played with them up through 2018. In July 2015, I took a free lesson with Jay Reid (PGA instructor at Birkdale) and he helped me shake some occasional shanks and improve my wedge game. Due to a shoulder injury playing softball in summer 2016 (and a re-injury in January 2017 thanks to football), I couldn't practice or play consistently for about a year and a half. I came back with a vengeance in 2018 though with over 10 sub-80 rounds. The highlight was my career best score of 73 (+1) at Monroe Country Club in September where I just missed a putt for a 72 on the 18th green (doh!). My handicap hit a career low 7.9 to end the year. In January 2019, I decided to finally get custom fit for new clubs at Club Champion with Rob Gallagher. Using their TrackMan, I chose Mizuno's JPX 919 Hot Metal Irons along with the TaylorMade M4 Driver, a Callaway Rogue 3-Wood, a Tour Edge Exotics Hybrid and Titleist Vokey SM7 Wedges. As of this writing, I've yet to play a full round with them but have hit them enough in practice to have big aspirations for the coming golf season.